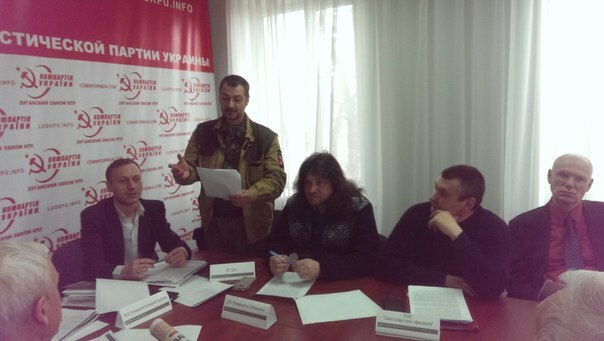 On the 9th of April left forces of Lugansk People’s Republic united in a regional forum to define next steps to undertake in the struggle for the best future of Donbass. They agreed on a “Unity Declaration” which we publish here. We, the participants in the Forum, note that the outbreak of war a year ago pushed the residents of Lugansk to the brink of survival, and plunged the region into chaos and destruction. Many of our compatriots have died or lost loved ones, some lost their homes, and some were forced to emigrate. Because of the military aggression and economic blockade by Ukraine, the economy is destroyed: the leading production facilities and enterprises are paralyzed. Thousands of people lost their jobs and opportunities to earn a living, the most vulnerable people — the elderly, children and the disabled — were left without pensions and benefits, and hunger and poverty knocked on the doors of tens of thousands of families. Today, the hope for peace, represented by the international agreements Lugansk is party to, puts social and economic survival at the top of the agenda: it is clear that humanitarian assistance cannot solve a hundredth part of the problems. We need to focus on how to rebuild the war-ravaged economy and bring life back to the region in a peaceful way. We, the representatives of communist, socialist, workers’, environmental and anti-fascist organizations, believe that the revival of Lugansk should begin and march under the banner of social justice, equality and fraternity. Only the socialist path of development will be able to successfully overcome the consequences of this military-humanitarian catastrophe. The authorities should not return to the discredited policy of appointing protégés of the oligarchic clans that robbed the Lugansk region for years. The Red traditions of the region — from Kliment Voroshilov to the present day- – have always been strong in our land, and just as in 1917, Lugansk should be a harbinger of the coming global left turn. It is only possible to achieve this goal through joint efforts and concerted action by all communist, socialist, left-patriotic and anti-fascist forces of Lugansk. We, the participants of the Forum, believe that among our organizations, forces and movements, protecting the rights and interests of the people Lugansk can be realized without disagreement on major issues. That is why we, the representatives of the Communist Party, Union of Left Forces, public organizations “Communists of Lugansk,” “Don,” “Communist Workers Organization,” “Intellectuals for Socialism,” “Anti-Fascist Committee of Lugansk,” Lenin Communist Youth Union (Komsomol), Union of Women Workers “For the Future of Children,” “Union of Soviet Officers,” “Social Democratic Initiative,” and “Green Ecological Union,” declare the establishment of a broad front of communist, socialist, workers’, anti-fascist and environmental forces, open to all who support the socialist course for Lugansk. • eradicate all forms of fascism, preventing the falsification of history. 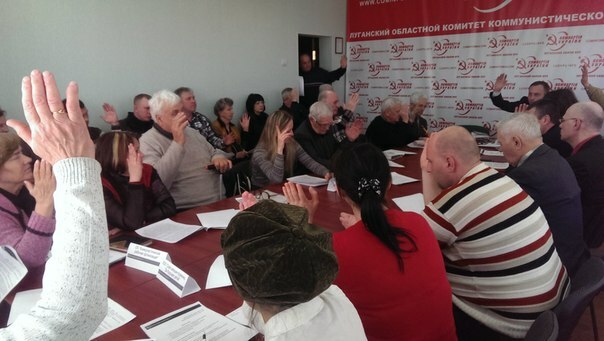 We are convinced that uniting our efforts will give Lugansk a unique chance to create a truly equitable social order, with working people at its center. We invite all those who share our goals to join the front and support us in the struggle for the revival of Lugansk and for a happy future for each of its inhabitants. Fascism shall not pass! Together we will win! This entry was posted in News and tagged communist, forum, left, Lugansk, Luhansk. Bookmark the permalink.